You will be required to present both passport from your home country and your international driving permit. 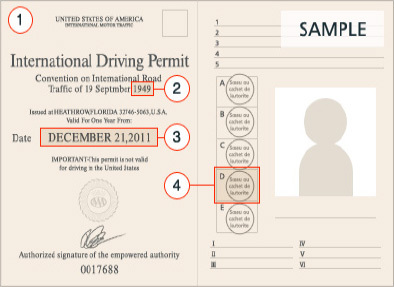 *International driving permits are only valid for one year from the date of issue (please confirm the date of issue on your permit). Additionally, international driving permits are only valid from the date of entry into japan (date of entry can be found in the immigration stamp in your passport). *However, persons on the basic resident register who leave Japan and subsequently re-enter the country within less than 3 months, will not have their date of entry (the start date for driving eligibility in Japan). For whom who reside in Japan with international permit, please refer to website of National Police Agency. For details, see here. *International driving permits acquired from signatory countries to the Paris Convention (1926), Washington Convention (1943) or Vienna Convention (1968) are not accepted. *A stamp is required for D box is required to driver vehicles with more than 9seats (including the driver's seat). *International driving permits issued in Japan are not permitted to drive within Japan. *International driving permits based on other dates are not accepted to drive in Japan. *Permits are valid for one year from the date issue. *For details on categories see below. Motor vehicles used for the transport of passengers and comprising, in addition to the driver's seat, at most eight seats, or those used for the transport of goods and having a permissible maximum weight not exceeding 3,500kg (7,700lb). Vehicles in this category may be coupled with a light trailer. Motor vehicles used for the transport of goods and of which the permissible maximum weight exceeds 3,500kg (7,700lb). Vehicles in this category maybe coupled with a light trailer. Motor vehicles used for the transport of passengers and comprising, in addition to the driver's seat, more than eight seats. Vehicles in this category maybe coupled with a light trailer. If you have a driver's license issued in Germany, France, Switzerland, Belgium, Taiwan, Slovenia, Estonia or Monaco, you are required to present your original driver's license, the authorized Japanese translation and your passport. Translations are valid for one (1) year from the date of entry into Japan. Please present your passport so we can confirm the date of entrance. ●Authorized Japanese translation of the driver's license should be issued by the respective country's embassy or consulate in Japan or by the Japan Automobile Federation (JAF). ● For Taiwanese licenses, a Japanese translation of the driver's license should be issued by the JAF or the Taiwan-Japan Relations Association. *1 Drivers who obtained ordinary license after Mar. 12, 2017. *2 Drivers who obtained ordinary license between June. 2, 2007 and Mar. 11, 2017. *3 Not permitted when vehicle maximum weight(weight of the vehicle and its maximum load) exceeds 7.5t. *4 Not permitted when vehicle maximum weight(weight of the vehicle and its maximum load) exceeds 8. For reservations by telephone, please contact the Nippon Rent-A-Car English Service Desk. *Telephone conversations will be recorded for our better telephone services. Cancellations: You can cancel your reservation online, by telephone, or by email. Changes: Please make a new reservation online again, then cancel the previous reservation. If the vehicle or rental date are not available online, please contact English Service Desk by telephone or by email. If you do not know your reservation number, please provide the driver's name and place and date of your car pick-up so that we can seach for your reservation. Please include the following information in your email. Cancellation charges apply for the cancellation of reservations. If you do not show up without notice more than one hour after the reserved time of car pick up, this will be regarded as a cancellation. The same amount will be paid by Nippon Rent-A-Car in the event that a reservation is cancelled by Nippon Rent-A-Car or a rental agreement is not made. No such charges apply when reservations are made and cancelled on the same day. *No tax is imposed on cancellation fees. (1) We will make a photocopy of your license, passport and related documents. (2) You will be requested to read the Rental Agreement and other related papers, and sign if you agree with the terms and conditions. (3) Payment by credit card is required at the time of pick-up. (4) Our staff will ask you to check and confirm the exteria of the vehicle. If you find any damage on the vehicle, please inform staff at this time. *Please return vehicles with a full tank of fuel. (1) Present fuel receipt on return. (2) Staff will check the vehicle with you. Do not leave any personal belongings in the vehicle. (3) You may be charged for any additional charges, if any. Available free of charge for all vehicle types. English / Japanese, Multi-lingual GPS available except trucks and dry vans. Available free of charge for all vehicles (exc. outlying islands). ETC card need to be inserted into ETC device before passing trough ETC gates on highways. Toll fees will be calculated when you return your car and ETC card. Fee：Rates are different from every Expressway Pass program. Good value plans to drive certain highways with fixed price. To use expressway pass program, you will be required to rent an ETC card from Nippon Rent-A-Car. All passenger cars and minivans are no smoking. All cargo vans, trucks and dry vans are smoking. *J-C, J-I and Y-C classes are equipped with standard 4WD. No additionally charge is required. If you are accompanied by a child under the age of 6, you are required to use a child safety seat. See here. 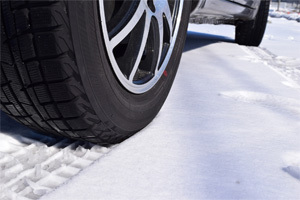 Winter tires are necessary options when you drive on snowy / icy roads. It is free at rental offices which are located in snowy area, while certain optional fees are charged at other rental offices. Please specify if you need vehicle equipped with snow tires at the time of reservation.Please see here for further information. Charge varies depending upon rental vehicle. In accordance with the Road Traffic Act, you are required to use a child seat when you are accompanied by a child under the age of 6. The ETC (Electronic Toll Collection) system enables drivers to pay toll fees without stopping at a toll gate. Tolls are charged based on the total amount of recorded usage in the IC chip of the ETC card. ETC cards need to be inserted into the ETC device before passing through ETC gates on highways. *ETC card rental service is available at our rental offices nationwide. Please reserve in advance. Please click here for further information. Nippon Rent-A-Car offers one-way rentals, so you can pick up a car at one rental location and return it to another (subject to car availability and locations). ●Drop-off fees vary depending upon distance and vehicle type. ●Please ask specific one-way fee at the time of reservation. *One-way rentals are not available at some rental locations due to location, environment next reservations, vehicle type selected, and other reasons. *One-way rentals are not available to locations on outlying islands such as Sadogashima, Tanegashima, Yakushima, Okinawa-Honto, Ishigakijima and Miyakojima. *Please contact your pick-up office when you wish to change your return location after car pick-up. One-way fees may apply. Cancellation charges apply for the cancellation of reservations. If you do not show up without notice more than one hour after the reserved time of car pick up, this will be regarded as a cancellation. The same amount will be paid by Nippon Rent-A-Car in the event that a reservation is cancelled by Nippon Rent-A-Car and a rental agreement is not made. No such charges apply when the reservations and cancellation is made on the same day. *A separate cancellation charge applies for microbuses. *No tax is imposed on cancellation charges. If you wish to extend your rental, please contact the pick-up office prior to drop-off and get their consent. An excess charge, which is described on the tariff, will apply at the time of car return if the rental period is extended. If you choose to cancel the rental agreement during the rental period after pick-up, you are required to notify the rental location and obtain consent. In such an event, the rental rates for the cancelled part of the period will be refunded with the specified halfway cancellation charges deducted. No refund, however, is available for halfway cancellation of rental periods less than 12 hours. HCC = (A-B)*50% A: Basic rental rates for the original rental period B: Basic rental rates for the completed rental period *Maximum HCC JPY 6,000. *Halfway cancellation charges differ for micro buses. ・If you fail to refuel, Nippon Rent-A-Car will charge you a prescribed refueling charge based on kilometers driven or indication of the gas gauge. Please be advised that the refueling charge in such case may be higher than that which would otherwise have been paid at a gas station. ・Please refuel with gasoline or diesel oil, as designated by the vehicle manufacturer. NOC will apply as part of the compensation for loss of use, arising from the non-usability of the rented vehicle during the repairing or cleaning period in the following cases when Nippon Rent-A-Car is not liable - traffic accidents, theft, engine failure, stains, etc. These charges will be the same regardless of the degree of the damage and the time required for repair. *NOC is not covered by CDW. *Taxes (including local consumption tax) do not apply to NOC. Regular Season and High Season applicable are based on location/area. Please refer to below map for respective season applicable for your rental office in advance. * Please check rates based on your date/place of car pick up. * Hkd Summer Season Rates in Hokkaido are different from ones applied in other part of Japan. * For cargo vans and trucks, rates are based on Regular Season all the year round. * High Season dates may be changed in every year. Your car MUST be equipped with Winter Tires if you are driving to areas with icy or snowy roads. Except for Okinawa and southern islands, all locations including cities such as Tokyo, Osaka, Kyoto, Nagoya, Fukuoka, etc. it may snow. It is seriously dangerous to drive icy roads without Winter Tires. Please check the road conditions and the weather forecast in your destinations. At the time of reservation, please be sure to select Winter Tires option when it is necessary. All locations in Tohoku area / Nikko / Kusatsu / Manza Onsen / Takaragawa Onsen / Minakami Onsen / Hakone / Mt. Fuji and lakes / Nagano / Niigata / Hida Takayama / Shirakawago / Kanazawa / Toyama / Alpen Route / North Kyoto (Amanohashidate / Tango / etc.) / Arima Onsen / Mt. Rokko / Mt. Koya / Tottori / Matsue / etc. Mt. Aso / Yufuin / Takachiho / etc. Your vehicle must be equipped with Winter Tires, when you drop off the vehicle in all snowfall areas below. Depending on the weather, it may snow in other area as well. After checking the weather forecast and road conditions, when if you find it necessary to have vehicle equipped with snow tires, please make a reservation for such vehicle accordingly. Winter tires are made of a special rubber that does not get hard easily, even in temperatures of 0℃ and below, and are designed to convey driving and braking forces to the road better than Normal (Summer) tires. As driving on snowy and icy roads with normal tires is extremely dangerous, please make sure to thoroughly check the weather conditions when driving in Japan. *Please note that if you reserve a car with regular tires, even in snowy regions, we may not be able to rent you snow tires depending on the weather conditions. *Depending on the amount of snow that has fallen, cars without snow tires may be prohibited on driving on some roads. 1. Gently and gradually press the accelerator pedal when accelerating from a standstill. If you accelerate suddenly, your tires may slip in place. 2. Do not turn, brake, accelerate, or decelerate suddenly while you are in motion. You may lose control and your car may spin. 3. Even on roads with a small amount of snow, they may be icy. Make sure to increase the distance between the car in front of you. 4. It is easy to spin when cornering due to centrifugal force, so make sure to slow down on the straight road before entering the corner. This push-enabled app gives alerts for Earthquake Early Warning, Tsunami Warning, Weather Warning and Eruption Warning within Japan. The App provides various functions useful for both foreign tourists and residents in Japan, Website Links that contain helpful information in the event of a disaster.